Many folks are already getting into the field for harvest this year and for those who collect yield monitor data, it’s a good time to ensure that you’re collecting accurate information. 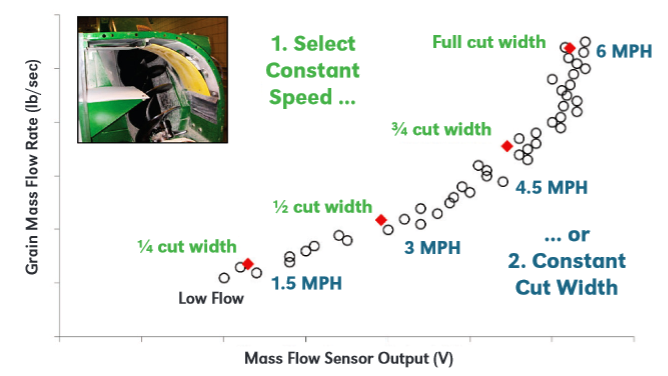 Figure 1: Two methods for varying clean grain elevator flow for yield monitor calibration: method 1 (in green) uses constant speed with varying cut-width; method 2 (in blue) uses constant cut-width with varying speed. The most important (and time consuming) aspect of collecting accurate yield data is calibration of the yield monitor system. While many operators can use calibrations stored in the display from previous years (always double check to see how well previous calibrations are performing), most will need to perform new calibrations. Remember that separate calibrations are needed for different crops (e.g., corn or soybeans) and accuracy will generally improve when calibrating for significant moisture variability for a crop (e.g., high and low moisture corn). For each calibration, try to conduct separate loads that span the variability (high to low) that you may expect to see when harvesting fields. Generally you can change combine speed or header cut width to varying crop flow through the machine to create this variation while calibrating. Figure 1 shows an example of how different calibration load points could be created by changing speed or cut-width to vary the flow rate through the machine. In general only 3,000 lb to 6,000 lb of grain are needed for each of these loads. Harvesting a full semi-load of grain per calibration load point won’t necessarily improve your calibration accuracy. Another common issue that often affects yield data is acceleration or deceleration while harvesting. Sometimes it’s necessary to stop quickly, but this will often contribute to over-estimating yield. Minimizing speed changes can help reduce these types of errors. Precision Agriculture: Best Management Practices for Collecting Accurate Yield Data and Avoid Errors During Harvest (EC2004), an overview of yield monitor errors. In the end, remember that most well-calibrated yield monitors should be able to estimate yields within 1% to 3% on a full-field basis and you’re likely to see errors exceeding 3% when looking at the sub-field scale.